Built-in front and back covers will protect your iPad 2/3/4 from every angle; the semi-transparent back cover specially treated with matte finish will show the perfect shape of your iPad 2/3/4, and prevent fingerprints and scratches at the same time. 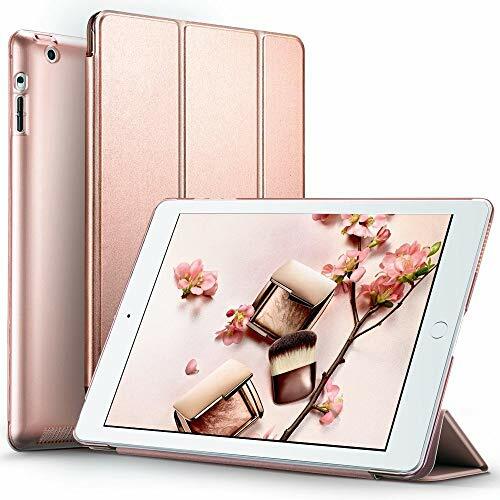 Built-in magnet to control the sleep/wake function, the magnet also keep front cover close firmly with the iPad 2/3/4 screen when you close the cover and put it in your bag, no more worry about scratches on the iPad Air screen or wake up of your iPad 2/3/4. And the trifold stand provides convenience for typing, watching videos etc. Design with slim feature that add no bulk to you iPad 2/3/4. Designed exclusively for Apple iPad 2/3/4 (model: A1460, A1459, A1458, A1416, A1430, A1403, A1397, A1396, A1395) , NOT for later iPad such as iPad Mini, iPad Air, iPad Pro, NOT for the newest 2017 iPad. Please check back bottom of your iPad to find the model number. Made of polyurethane material with soft microfiber lining. The semi-transparent hard back cover specially treated with matte finish will show the perfect shape and logo of your iPad, and prevent fingerprints and scratches as well. Magnetic Cover that instantly wakes up iPad when opened, and makes it go to sleep once closed (so no wasting precious battery life). No more worry about scratches on the iPad screen or wake of your iPad. Only 13mm and 216g, ultra slim and light weight, add no bulk to you iPad. Tagged Auto, Back, Case, Cover, Frosted, Function, Gold, iPad, Leather, Light, Magnetic, Rose, Sleep/Wake, Smart, Synthetic, Translucent, Weight, Yippee. Bookmark the permalink.